The Mangala Sutta is one of the most widely known of the Buddha’s discourses. The term“Mangala” means something good or auspiciousness, or lucky, or a good sign or omen. The Mangala Sutta is included in the Khuddakapatha, the first book of the Khuddaka Nikaya. How this Sutta came to be delivered by the Buddha is mentioned in the Sutta itself. For twelve years, devas and men, wishing to have happiness and well-being, pondered over the question of what constituted a “Mangala” or auspiciousness. In those days, people were steeped in superstition and their actions were mostly guided by certain signs and omens which they considered to be auspiciousness. There were differences of opinion and they could not get a consensus among themselves in deciding what exactly was a “Mangala”.Subsequently the Buddha, greater than all devas andmen, was approached and requested to resolve the problem. He has taught things auspicious which destroy all evils, which are for good of the whole world. The Mangala Sutta is also one of the first lessons every Buddhist child has to learn either at home or at the monastic school. 1-Not to associate with the foolish. 2-To associate only with the wise. 3-To honour those who are worthy of the honour. 4-To dwell in a suitable locality. To live in a suitable place. 5-To have done meritorious/good deeds in the past. 6-To set oneself in the right course. 7-To have a wide, general knowledge in mundane and supra-mundane levels. To have vast learning. 8-Being skilful in the technology and handicrafts. To be skilful in arts and science. 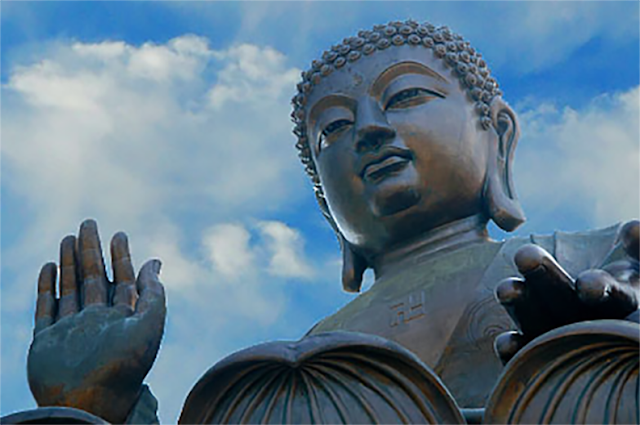 9-Learning and abiding by the rules of conduct and disciplines laid down by the Buddha for lay devotees and monks. To be learned in the moral discipline. 10-Speaking what is true, pleasant and beneficial to others. To speak good words. 11-To attend closely to one’s parents. To support parents. 12-To take care of one’s wife and children. To provide for wife and children. 13-To perform a faultless work at a proper time. To be engaged in peaceful occupations. 14-Performing acts of charity. To be generous in alms-giving. 15-To live righteously performing the ten kinds of meritorious deeds. To be righteous in pure conduct. 16-To support one’s paternal and maternal relatives with food, money, encouraging words and good advice. To help one’s relatives. 17-To perform a blameless action. To be blameless in actions. 18-To resolve mentally to refrain from all evils. To abstain from bodily misdeed and evil speech. 19-To refrain from committing three bodily and four verbal evil deeds. To refrain from evil thoughts. 20-To abstain, refrain from any intoxicating drinks and drugs. 21-To be steadfast in moral virtue. Not to be negligent in doing good deeds. To keep the moral precepts. To practise meditation. 22-To pay respect to those who are worth of honour, reverence. 23-To be humble and modest without pride and conceit. To be humble. 24-To be contented with whatever one possesses presently. 25-To acknowledge others and repay one’s debt of gratitude. 26-To frequently listen to the Dhamma. 27-To forgive the insult caused by others and be patient without bearing a grudge. 28-To obey readily the advice given by elders and learned persons. To be obedient. 29-To see noble persons who have purified or are trying to purify their minds from all defilements. To see holy monks. 30-Discussion of the Dhamma with learned persons at the proper time can lead one to prosperity in the present as well as in the future. To holy religious discussions on the proper occasions. 31-To practise austerity by controlling one’s sense faculties in order to scorch all defilements. To possess self-restraint. 32-To undertake the noble practice such as observing the precepts and developing concentration and insight knowledge in order to realize the Four Noble Truths. To lead a holy and chaste life. 33-To have perception of the Four Noble Truths. 34-To realize Nibbana and enjoy the highest bliss. 35-To stand steadfastly with an unshaken mind when one is confronted with the ups and downs of life worldly conditions. To be unruffled by the weal and woe of life. 36-To be free from all worries. To be released from sorrow. 37-To have a mind free from the dust of all defilements such as greed, hatred, ignorance. To be cleaned from impurities. 38-To possess a peaceful mind free from all dangers of defilements. To attain absolute security. And flowers of benefit shall bloom. Content in mind and body they be. Thus, wear it! Adore it!